Shoes for all occassions in a variety of styles, colors and sizes. We believe that the proper shoe is essential to completing your custom look. Many gents go for the same/wrong style, drawing the eye down and distracting from the cohesiveness of a finished, tailored ensemble. 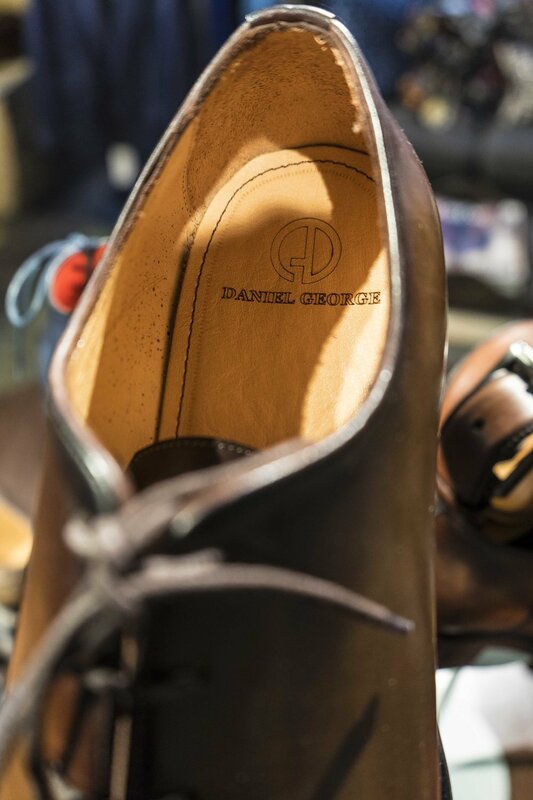 Daniel George offers shoes for all occassions in a variety of styles, colors and sizes. Taking the guess work and the "hunt and peck" of finding the correct shoe away, we'll make it easy for you to walk out with the perfect shoes on your feet. Let us show you the best option for your business suit and blazers, as well as fun pairing suggestions for jeans and sports coats. For example, the black patent leather shoe for a tuxedo is unnecessary, and a good rule to go by is what we often say... black after six, and brown for downtown. Don’t see exactly what you’re looking for in store? Make your vision come to life with our bespoke shoe service. For $525, you have the ability to create a completely customized design— from upper leather, to shoe style, to sole fabrication. Each shoe is handmade by artisans from premium Italian leather and able to be personalized with your name.